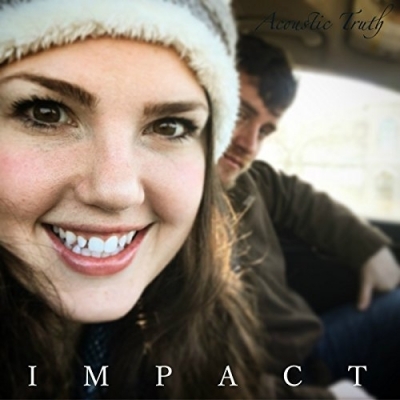 Contemporary Christian duo Acoustic Truth, composed of Ryan and Sarah Knott, have released their latest album 'Impact'. It has already hit #7 on the Christian charts on iTunes and #23 overall on iTunes. Read More Contemporary Christian duo Acoustic Truth, composed of Ryan and Sarah Knott, have released their latest album 'Impact'. It has already hit #7 on the Christian charts on iTunes and #23 overall on iTunes. With their distinct vocals and natural ability as songwriters, the Knott's strive to provide hope and inspire people through their music. The two best friends from Chicago met while interning at Camp Star, a summer camp for children with special needs. The pair kept in touch and routinely exchanged music between each other but it wasn't until summer 2011 that they wrote their first song together and finally decided to partner up in hopes of bringing back heartfelt music that has been lost over the years. The couple now married with a son (Jeremiah James) play nationwide shows but still find their way back to their ministry every Saturday night as the praise band. "If we can help one person find the love of Jesus Christ each day, we are that much closer to our mission as Christians. Music is our outlet to do that", said Acoustic Truth. The name of the band really does give away the sound this duo create with their music. Yes, this is an acoustic sounding band, think relaxing coffee shop music at its very best. Yet the biggest draw of this band is that the husband and wife duo's vocals work together so well. Both vocalists sound amazing on their own, but together the richness of their vocals creates something really special. So what do the songs sound like? Well, 'Free' sounds a little bit like The Corrs, if you remember them. The song 'You You You' has a great country beat and a really lovely chorus. 'Unchanging' starts off as a clever and beautiful sounding acoustic song, yet for a band called Acoustic Truth they still know how to pull out the electric guitar sometimes. It took me by surprise and actually because of that kept the album moving and 100% kept me on my toes for the rest of the album. So don't expect the same acoustic sound throughout, not that that is a problem because the tone of the guitars on this album are very good. The chord progression in the chorus of 'Birds of The Air' is lovely and 'Come to Me' is so well written it really digs deep into the heart of the song with raw and honest lyrics about pain. The song talks of drawing closer to God in those struggles. But Acoustic Truth have not just used cliche words and throw away statements, as sometimes when the pain and hardship is at its hardest you don’t want cliches. I need to say this statement on its own. The song 'Save The Children' is a truly beautiful song. 'Messiah' is straight out of the Rend Collective book of folk music. Well that’s what I thought at first anyway. This song is much more in your face than that. It’s harsher, maybe even darker musically, and the electric guitar is called upon again and it even has a little guitar solo. This song is a bit more theatrical, lyrically and even musically. Again this sound doesn’t really fit on an acoustic album, but it sorts of works here! That’s why I love these two, don’t get too comfortable as you never know what's coming next! All in all this is an earthy record recorded by two very talented songwriters and singers who are clearly just a lovely duo. Here we not only have some great music, we also have really strong lyrics and amazing harmonies from a beautiful husband and wife duo.